NCIF evaluates an institution’s impact in low- and moderate-income communities using our Social Performance Metrics. How many of a bank’s branches are in distressed communities? The percentage of a bank’s branches located in low- and moderate-income census tracts. 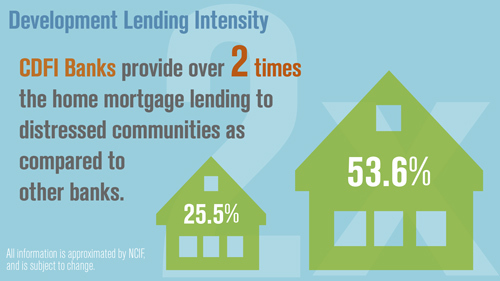 How much of a bank’s lending is in distressed communities? How much development lending does a bank create for each dollar invested in it? A bank’s HMDA lending in low- and moderate-income census tracks as a percentage of total shareholder equity. This represents the amount of equity reinvested into LMI communities each year. How much of a bank’s lending is mission-related? Mission Intensity captures the comprehensive amount of lending which supports a bank’s social mission, regardless of a loan's location. It is the percentage of a bank’s total annual lending that supports the bank’s mission by 1) being located in a qualified census tract or 2) supporting a specific mission-relevant category. Banks designate a range of categories as being mission-relevant including loans to low-income borrowers or other targeted populations, loans to nonprofits or faith-based organizations, loans to minority- or women-owned businesses, environmentally-focused lending and more. In addition, NCIF collects information on addition variables, including: jobs created and retained, affordable housing units financed, diversity in staff and governance, products and services offered, environmentally-responsible practices and more. All information is based on annual HMDA data (ffiec.gov), Census data, and annual Summary of Deposits data (fdic.gov), and Statistics on Depository Institutions (fdic.gov) as well as private reporting from banks where appropriate. DLI-HMDA and DDI are as of 2013. Financial data is as of 12/31/2014. All information is gathered from or calculated using publicly available data. NCIF is not responsible for any inaccuracy.